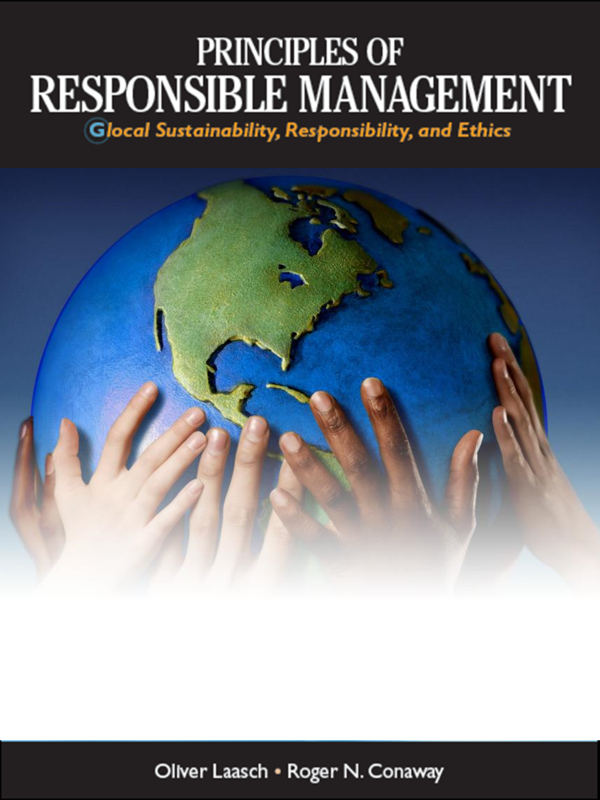 After five years of work from idea to publication, the first United Nations Principles for Responsible Management Education (PRME) textbook, “Principles of Responsible Management,” will be published through Cengage end of 2013. The book, lead-authored by Oliver Laasch and Roger N. Conaway, answers the urgent need for an applied and comprehensive textbook for responsible management education. Nick Tolhurst, author of many landmark publications in CSR, has been a driving force in the conceptual design of the book and in assuring pioneer interviews with outstanding individuals. The book´s primary use is as a required textbook for business sustainability, responsibility, and ethics courses, as offered by many business schools. Secondly, business degree programs will find the book´s chapters on mainstream business functions, such as strategic management, accounting, and human resources, to provide valuable contents for a coverage of sustainability, responsibility, and ethics across the curriculum. Chapters will be available to be bought individually. A third possibility is to use the book as primary text for first year courses, such as “Introduction to Management”, as each chapter´s responsible management contents are structured around the logic of mainstream management concepts. Even before its official publication, the book has been well received. Five out of six reviewers stated they were very likely to adopt the book. Positive points they highlighted were the conceptual rigor, practical application, and strong chapter structure. 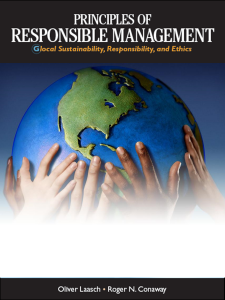 Several dozens of academic institutions have made firm commitments to use “Principles of Responsible Management Education” for their sustainable leadership, business ethics, and business and society courses. Educators interested in adopting the book are welcome to get in touch with the lead author and CRME founder Oliver Laasch, to discuss strategies for adoption of the book or to receive ancillary materials. The book will be pilot-tested in courses around the globe before its official launch. For a more extensive description, please check the book outline available on the UN PRME homepage as part of the call for contribution. For reviews of the book, here, for access and pricing options here. 1 Pings/Trackbacks for "Preview Textbook: “Principles of Responsible Management”"